There are now two leaders in Nalchik. 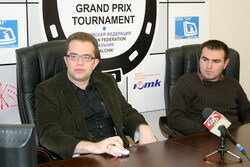 Leko confidently defeated Kasimdzhanov and caught up with Aronian, who barely survived against the inspired Kamsky. Everything will be decided tomorrow in the individual game between the leaders. Aronian plays White. A classic example of the equally strong sword and shield. 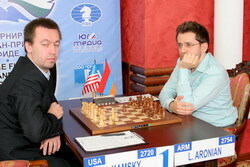 Kamsky attacked brilliantly, but Aronian defended with incredible accuracy. I think Black’s opening was far from perfect. For instance, the knight maneuver to b6 is unconvincing. White quickly completed his development and created a strong attack in the center by 12.f5! Levon accepted the challenge, taking everything his opponent dared to sacrifice – a pawn first, then an exchange. Basically, after 14…Bxf5 and until the end of the game Levon was constantly parrying various threats, making many only moves in process. White’s exchange sacrifice 16.Rxf5! is excellent! Kamsky could create very annoying pressure by the tricky 18.d4!, restricting Black’s knight and passing the right to move to the opponent. In my extensive analysis I didn’t find how to equalize for Black. White could get excellent winning chances. Levon’s smart knight maneuver allowed him to exchange White’s powerful bishop. Later Levon made a very timely piece sacrifice (21…0-0-0!) and managed to survive without much trouble. In the subsequent game Black’s rook and pawns successfully held against two minor pieces. Rustam was unable to hold against a better prepared and motivated opponent. 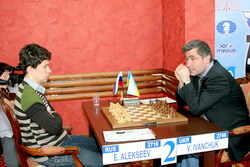 In the Petroff Defense White maintained some pressure on a half-empty board, as he controlled a central file. Leko used his kingside pawns as a weapon, and it seems Kasimdzhanov accelerated this by 19…Nf6. Instead of it, he could play 19…c5 or even safer 19…c6 with the idea to meet 20.h6 by 20…b5!, fixing the pawn structure completely. Rustam’s decision to bring the knight to g8 (20…Kh8?!) turned fatal (once against better was 20…c6, intending b7-b5). Peter’s powerful 22.c4! created tension in the center, and Black was unable to bear it. 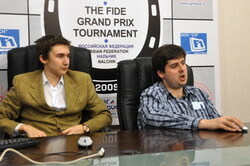 Rustam eventually got rid of the h6-pawn, but paid dearly for it. The last mistake (27…f5?) reduced Black’s pain. Black played very creatively in the opening (substituting the usual 6…0-0 by 6…dxc4), but failed to equalize. White got the space advantage, while Black had a very weak pawn on c6. Shakhriyar brilliantly sacrificed a pawn by 14.e6! and created strong pressure. Pavel sacrificed his pawn in response – 17…c5. I think White should have taken it in a different way: 18.Rfe1!? c4 19.Bg3! 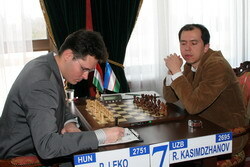 Re8 20.Qxd5 – in this case he keeps many pieces on the board and maintains a significant advantage in the center. In the resulting ending Black quickly brought the king towards the center (22…Kg8!) and secured certain compensation for his material loss. 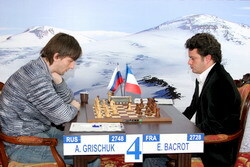 Both grandmasters played really well in the subsequent complications. The assessment “White is slightly better” remained unchanged until the draw was agreed. This masterpiece was tailored with the best tactical fibers, and can be added to the Petroff textbooks intact. White made an interesting new move in an old but still popular line –12.Qa4+! ?, but it seems it was anticipated by Boris. If I am wrong, I beg the pardon and express my utmost admiration to both players. Every move they played was perfect, and it resulted in an almost equal position, in which Black’s strong knight on d5 compensated for White’s long-range bishop. Every defeat comes unexpected. This game started well for Peter; White’s pressure in the Zaitsev wasn’t particularly dangerous. The players relentlessly simplified the position, but Black took too long before making the freeing d6-d5 break. He should have played it on the 27th move, and then the game would most likely be drawn, while after 27…Rde7?! 28.Qb2! White created dangerous pressure on the a1-h8 diagonal. In order to defend it Black had to fianchetto his knight, which gave White a few tempi to develop the initiative and advance his passed pawn. In the time trouble Svidler committed a couple of errors (instead of 35…Qc7 more accurate is 35…Qc5, and instead of 39…Rc8 much better is 39…Re7! ), and Karjakin managed to trade the b7-bishop, which was the only obstacle for his passed pawn. 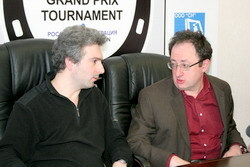 Black’s position got worse, and his defeat did not surprise anybody. Sasha reminds me a fearless boxer with strong neck – his opponents hit him a lot, but he always hits back, and never falls. As far as I see, the most difficult thing in this game for Grischuk was avoiding the move repetition in the time trouble. This time he succeeded, repeating all possible positions just twice. Bacrot was up to the task for a long time, but made a mistake in the ending. The automatic 45…Rxb4? was losing, while 45…c3! would make a draw, as in this case White could not take the d6-pawn and keep his e4-pawn at the same time. After White traded an exchange for two pawns (by 48.Kxd3! ), Black was unable to defend against the connected passed pawns, and was one or two tempi short for creating adequate counterplay. This game was quite interesting (the Sicilian Defense led to a sharp fight in the center), but the crowd in the internet gone wild in the queen ending. Why on earth Alekseev did not transpose to a winning pawn ending by 33.Qd3+? It turned out that the former Russian champion knows pawn endgames better than computer-armed internet experts. This ‘won’ pawn ending led to a drawn queen ending... Here are some exemplary lines: 33.Qd3+ Qxd3 34.cxd3 Kg6 35.Kc2 Kf6 36.Kb3 Ke6 37.Ka4 (37.Kc4 Kd6!) 37…Kd5 38.Kxa5 Kd4 39.a4 Kxd3 40.Kb5 f5 41.a5 (41.gxf5 g4!) 41...e4 42.fxe4 fxe4 43.a6 e3 44.a7 e2 45.a8Q e1Q (Black makes it right on time!) 46.Qd5+ Ke2 47.Qxg5 Qb1+ 48.Kc5 Kf3 49.Qxg7 Qc2+ 50.Kd5 Qe4+ 51.Kd6 Qxg4 52.Qxg4+ Kxg4 – and this pawn ending is drawn. Therefore the result of the game is logical and fair.